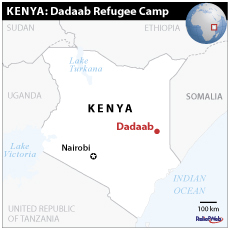 Dozens of refugees have been injured in a security operation by police in the Dadaab refugee camps, northeastern Kenya, following six explosions since early November, one of which killed a policeman on 19 December. “We are being told to surrender the Al-Shabab-linked persons carrying out the attacks, yet... the police, who we expect to protect us, are instead proving dangerous to our lives," Isnino Ali Rage, chairman of the Dadaab refugee community, told IRIN on 21 December. Camp residents said the police arrested dozens of refugees and beat up others in the operation, which started in the afternoon of 20 December and extended into most of the next day. Residents said the police were looking for explosives. In Nairobi, police spokesman Eric Kiraithe told IRIN on 22 December that the objective of the operation was to weed out criminal elements in the camps "masquerading as people in need". "Nobody will create a safe haven for kidnappers, killers and makers of explosives; the operation will continue to ensure the camps are secure for the refugees, aid workers and police officers there," Kiraithe said. He said people linked to Somalia's insurgent group Al-Shabab were using Dadaab, which holds some 460,000 refugees, to plan attacks. Regarding claims that the police used excessive force, Kiraithe said any professional misconduct by officers would be investigated. He said at least 90 police officers had been recently deployed in Dadaab "but we are increasing the numbers depending on the security needs on the ground". The explosion in which the policeman was killed and several others injured took place in Hagadera camp. The second explosion on 20 December occurred in the main market of Ifo camp and targeted a police vehicle, which narrowly escaped destruction. The refugees said the operation began soon after the Ifo market explosion, with officers breaking down doors to shops and houses in search of weapons and explosives. Business people reported heavy losses. "Almost all my property was destroyed, the computer and the big refrigerator; I am also missing hundreds of thousands of Kenyan shillings,” Ali Deck, 25, a refugee and businessman in Ifo camp, told IRIN. "There are no banks in Dadaab, we keep all our money in our shops." Few refugees ventured out of their tents during the operation. Those who tried to take food to those who had been arrested earlier were also detained. The injured could not access hospitals. Health and aid workers stayed indoors, local residents said. Aden Hassan, 75, a resident of Ifo's Section C18, told IRIN his son was badly beaten up. "My son is mentally handicapped; he ran into the house when the police jumped over the fence but they pulled him outside and beat him mercilessly, they left him bleeding." The operation ended after a group of community leaders went to the local police station and held discussions with the officer in charge. One of the elders said the officer told them the operation would continue until the refugees surrendered the "evil ones" living among them. "There is nowhere to run; on one side, we are threatened by the fear of the unknown Al-Shabab, who are said to be in the camps, and on the other side we are being harassed by the police," Mama Nahwo Sirat, one of the elders at the police station, said. "I pray to God that we find a way out of this bad situation." UNHCR spokesperson Emmanuel Nyabera told IRIN on 21 December the agency was committed to ensuring Dadaab's civilian character was maintained. "We are concerned about security in Dadaab; and we are working with the government to ensure that we have access to the refugees," he said. After the recent explosions, aid worker movements and services have been restricted.